Our shelters have been used as smoking shelters, bus stop shelters, valet shelters, equipment shelters, turnstile shelters, transit bus shelters, ATM shelters, prefabricated shelters and many other custom prefabricated modular building applications. Wherever you need to provide outdoor cover for people, the simplest and most cost effective solution available is a modular shelter. With a huge range of different options available to ensure that no matter what your requirements are in terms of size or shape, there is a shelter that can be provided quickly and effectively in modular form. One of the main advantages for you in choosing modular shelters for your outdoor protection needs is the speed with which the structure can be provided. Thanks to the methods of construction that are used, almost any size and shape of shelter can be created, and then installed wherever it is needed very quickly in comparison with the standard methods of construction available. 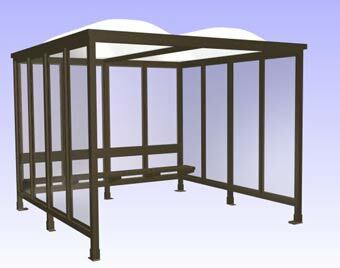 One of the most popular designs of modular shelter is the standard bus stop shelter. These ubiquitous structures are familiar to us all, and are increasingly important as we turn to public transport in order to improve our environment. Thanks to the advanced techniques and components that are used in the construction of these modular shelters, it is possible to use the same basic parts as the building blocks for a wide variety of different structures. Sharing components across different platforms means that the actual process of building can be made much simpler without compromising on the quality of the work. It also means that the overall costs of construction are much lower as common parts can be used without meaning that the finished result is confined to a particular form. One of the main advantages of using prefabricated modules in order to produce modular shelters is that the exact specifications of the unit can be set out in advance of construction, and all the components can be delivered to site ready for immediate use. Once the shelter has been constructed and all the various parts installed into place, no further finishing is required, and users can take advantage of the shelter immediately. Depending on the exact specifications that you set out, it is possible to create an almost infinite variety of configuration for your new modular shelters, from simple one walled structures through to much larger fully enclosed areas that will protect users completely from the outside elements, the number of options is practically endless. You can also specify a huge number of options to define exactly how you want the finished shelter to look, including color of glass, the type of paint that is used, as well as a variety of different colors so that you can ensure that your new shelter will fit in with the corporate identity that is displayed on all of your other units, rather than looking out of place. 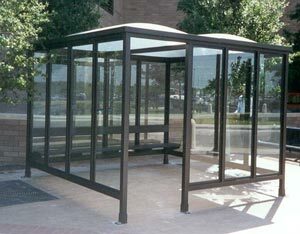 Whether you are in charge of a mass transit system and want to provide a network of bus stops, or simply want to provide an outdoor smoking shelter for the use of staff during the day, modular shelters have a number of advantages over conventional buildings: They are quick to install, easy to maintain, and completely flexible. You simply specify the kind of design that you want for the units, and they can be delivered to the site in kit for ready for assembly. Our portable shelters are found protecting employees and equipment at Fortune 500 companies, government and military installations, airports, manufacturing facilities, parking lots and anywhere else your imagination may take you. When choosing a outdoor storage shed or building, it is important to think about weather proof walls, .dimensions of the storage shed and how secure the prefab building need to be. If you are installing a number of portable waiting shelters in order to provide comfort for your passengers, there are a number of factors that you will have to consider. One of the main advantages of aluminum shelters is that they are basically weather proof, and the metal that they are made of does not corrode as steel would. The concept of a temporary shelters employed by us is as a structure that is designed to be used again and again. TRANSIT SHELTERS are one of the main ways in which this perception can be shifted, and thanks to the latest advances in the construction and design of these products. A portable prefabricated smoking shelter needs to allow staff who chose to smoke to have an area where they can go in order to enjoy a cigarette without having to be exposed to inclement weather, or to impose their smoke on non smoking staff. Outdoor Shelters. Protection from the elements and the creation of a safe environment for staff and customers are the main reason for the construction of modern outdoor shelters. Bus Shelters. Thanks to the use of a modular design for bus shelters, it is possible to produce a wide range of different designs from a basic set of panels. Steel Shelters. For any purpose where you might want to provide protection from the elements outside, there is a steel shelter available to suit your needs. Outdoor Smoking Shelters. When you choose the outdoor smoking shelter that you need for your business, the location where you are going to put it must be an important part of the plan, and be taken into account during the design process. 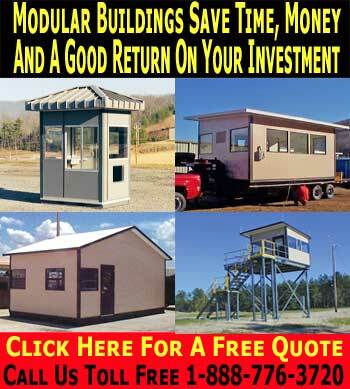 School Bus Stop Prefab Modular Shelters. If you are installing a number of school bus stop shelters in order to provide comfort for your passengers, there are a number of factors that you will have to consider. Prefab Shelter Installation. There are as many different types of prefab shelters available as there are uses for these innovative and simple structures. Houston, Dallas, Austin, Katy, Woodlands, Galveston, San Antonio, Fort Worth Texas. Prefabricated Shelters. Unlike building from scratch, a prefab shelter offers a number of advantages. Firstly, the time taken to build and install the shelter is absolutely minimal.